The first time I went to Washington D.C. I was in Jr. High. Even at my young age, I fell in love with this city. Fortunately for me, I've been able to go back several times over the last few years with my Worker Bee and I've fallen in love all over again. We've been in D.C. this past week and I wanted to share with my readers some of our favorite D.C. traditions. I've tried to think outside of the box and choose things that aren't normally mentioned. You've all heard about places to visit like the Smithsonian, The White House, The Capitol, etc. We've been to all of those amazing places and loved them, but you can find them in any old guide book. This is the Hive 5 for Washington D.C.
1. The Hay Adams Hotel: I love this hotel. The decor is so beautiful and classic and the rooms are comfortable and inviting. The bed here is heavenly! The best part is that they leave you a little gift on your pillow each night. Not just chocolates, but cute little bottles of foot scrub or eye cream. It was like getting a little present each night. Things like that make me happy. :) It is in the perfect central location for sightseeing, located right across the street from the White House. Your hotel room could even have a White House view. This is the quintessential Washington D.C. hotel. 2. 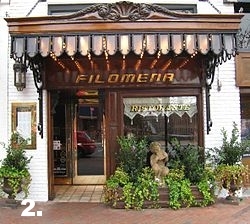 Filomena: This restaurant has the best Italian food we've ever eaten. Words cannot describe the deliciousness. It is a favorite among celebrities and politicians too, the menu is filled with names of famous patrons. You can try a favorite dish from U2's Bono or a former U.S. President. You won't leave disappointed. 3. Nationals Baseball Park: If you're a baseball fan like we are, catching a DC Nationals' game is a must. 4. Segway Tour: We've done the Segway tour several times and continue to love it. It's a great way to see all of the monuments. If you're visiting DC with a teenager, trust me, this is a must. If the idea of driving a Segway overwhelms you, don't worry. If I can drive a Segway, anyone can drive a Segway. No athleticism or coordination is required. 5. Ben's Chili Bowl: This has been a DC Institution for over 50 years. Yummy burgers, chili dogs, cheese fries, you know, all that healthy stuff. :) Lot's of history here and such a friendly staff and unique atmosphere. Whenever we've been here the daughter-in-law of Ben himself is here mingling among the tables and taking pictures with diners. It's not only delicious, but a fun experience.